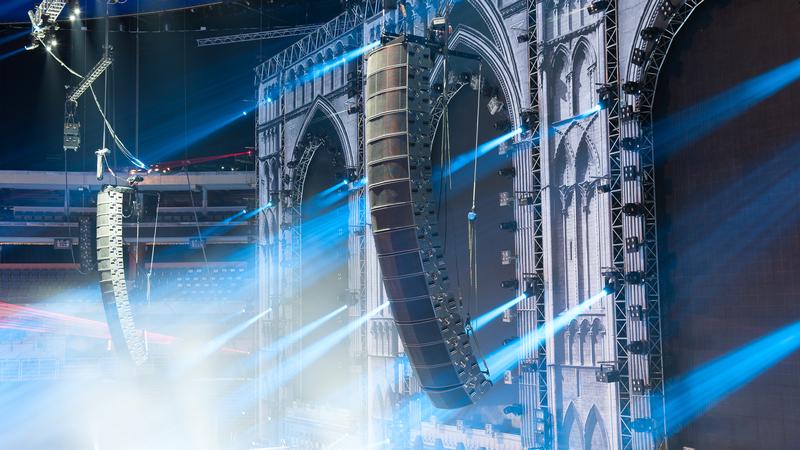 Following six years of development, British loudspeaker manufacturer, Funktion-One, has chosen Prolight + Sound Frankfurt for the launch of Vero – the new, large format touring sound system that is set to re-define audio and operational performance expectations. The company will also debut the Evo 7T Touring loudspeaker and F132 bass enclosure at the show. The impetus for Vero germinated from frustration with the declining standard of audio quality in the live environment, coupled with an understanding that the industry’s ergonomic expectations demand a system that can be flown quickly and easily, and with minimal crew. In answer to this, Tony Andrews, John Newsham and the Funktion-One team have designed a system that is conveniently arrayable and boasts a new level of performance characteristics relating to sound quality, efficiency and directivity. Vero is a complete system, with each element specified or designed for the highest possible performance. The system includes speakers, amplifiers, cabling, rigging, transport dollies, weatherproof covers and software. The Vero speaker range features six highly efficient, low distortion horn-loaded loudspeakers – the V60 mid-high, V90 mid-high and V315 mid-bass with a choice of V221, V124 or V132 bass. The V60s, V90s and V315s all have identical dimensions, enabling them to be flown in the same vertical array. The ground stacked V221, V124 or V132 bass enclosures offer a choice of size and low frequency extension. Vero is powered by Lab.gruppen PLM 20K44 amplifiers, featuring bulletproof reliability, tremendous power from a compact package, onboard processing and the sonically superior Dante networking for signal distribution. Three PLM 20K44 amplifiers and mains distro are fully shock mounted in an innovative, compact rack, complete with sliding doors that conveniently stow in the roof of the rack. Vero’s patented Lambda flying system is designed for speed, safety and ease of use. It allows Vero arrays to be deployed accurately and efficiently. All rigging settings can be calculated using Vero’s Projection software. Unlike most other flown arrays, Vero’s inter-cabinet splay angles can be adjusted with the system in suspension. Vero’s Projection design and prediction software allows Vero users to optimise array designs for smooth audience coverage in any venue. Projection provides venue plan, cross-section and 3D screens. Features include a user-friendly interface, a measurement tool calibrated in distance and time at the speed of sound, and colour coding to differentiate between the different types of enclosure. It’s set to be a busy show for Funktion-One, as it also launches the first touring product from the Evolution Series. The Evo 7T sees the Evo 7E adapted for touring applications, following demand from distributors and rental partners. The Evo7T features integral flying gear and will, initially, be available with a weatherproof black polyurethane coating and grille designed for the requirements of live and theatre applications. A grille-less version and colour options will be available in the future. The Evo 7T is fully horn-loaded with 15in mid-bass, 10in Funktion-One signature mid-range and a 1.4in compression driver. It has 40° nominal horizontal dispersion and physically arrays at 30° three wide, giving smooth coverage to 100°. The third and final launch for Prolight + Sound Frankfurt is the F132. The extraordinarily powerful horn-loaded bass enclosure features Powersoft’s M-Force 10kW linear transducer and Funktion-One’s specially designed cone and enclosure technology. Its single 32in driver gives a frequency response of 24Hz to 70Hz. Andrews says: “As soon as I saw it and became aware of it, two Frankfurts ago, I knew it was an important development. The trick was to apply the power of the motor to the air in the most efficient way possible. I knew it was something we had to work with. Funktion-One will exhibit in Hall 3.1 Stand E81 at Prolight + Sound Frankfurt, 5-8 April 2016. Countdown to Vero launch is on!